The goal of data analysis is to uncover patterns and relationships among data. We will practice this in the following activity. 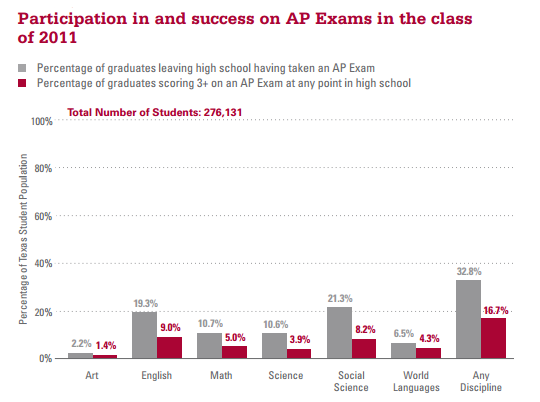 Let's look at this graph from the AP Report to the Nation 2012, published by the College Board.10 This chart represents AP Exam participation and success for Texas high school graduates in 2011. Take a moment to examine the chart. 1. What percentage of graduates took an AP English exam? 2. What percentage of AP English exam takers scored a three or better? a. The percentage of high school seniors who took an AP exam. b. The number of students who took an AP Social Studies course. c. The percentage of graduates who scored a five on an AP Math exam. d. The number of students who took an AP exam. e. The number of graduates who took an AP English exam. This activity illustrates the point that we can glean substantial information from data displays, some of them explicit and some of them implicit. We might need to complete some additional calculations to find the data points of most interest to us. Additionally, when drawing conclusions from data, we must be certain that we clearly understand the report. Finally, we might uncover additional questions based on the data that are not represented and decide we need to seek further information. The most effective way to analyze data is with a team. A group of individuals will uncover more trends and have greater insights about the data than any one individual alone. This team will also be responsible for the next step in the data-to-action planning process.